If you want the top-of-the-line gaming hardware in a laptop then you generally need to compromise on the weight and portability aspect. However, Acer hopes to change that perception with its new Triton 700 and Helios 300 gaming laptops. Announced during the [email protected] global press conference in New York, both laptops feature the company’s new AeroBlade 3D metal blade fans which is said to increase airflow by 35 percent without taking too much space. The Triton 700 will go on sale in the US in August, starting at $2,999 (approximately Rs. 2,03,900) while the Helios 300 will be available starting July at $1,299 (approximately Rs. 88,340). 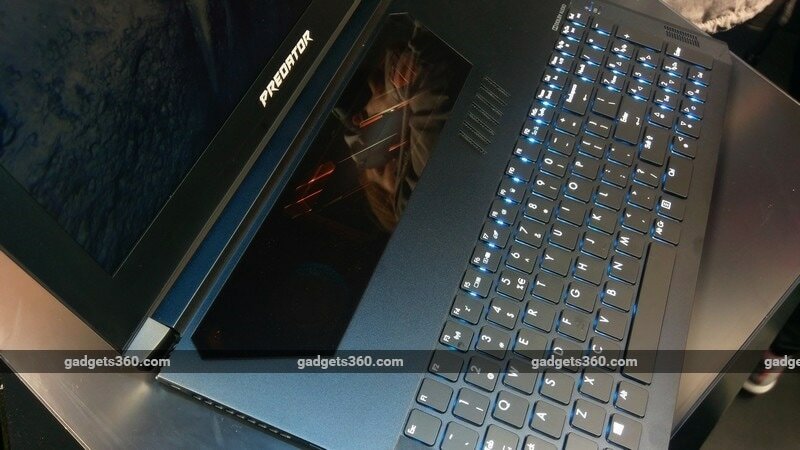 The Predator Triton 700 is the top-end model, which according to Jerry Hou, General Manager, Consumer Notebooks, is built on the learnings of the Predator 21 X which was first showcased at IFA 2016. Due to the new cooling technology, Acer is able to offer top-end specifications in a chassis that measures 18.9mm in thickness and weight of 2.6kg. The laptop has an aluminium body which houses a 15.6-inch full-HD display and is powered a standard-voltage 7th Generation Intel Core i5 or i7 CPUs, Nvidia GeForce GTX 10 series GPUs, up to 32GB of RAM and up to two NVMe PCIe SSDs in a RAID 0 configuration. There’s a Corning Gorilla Glass plate above the keyboard which lets you have a peak at the new cooling solution and the heatpipes, which also doubles up as a trackpad. In terms of connectivity, the laptop has Thunderbolt 3 and Killer Network’s DoubleShot Pro networking for dual 4K video-out support, two USB 3.0 ports, single USB 2.0 port, Gigabit LAN and HDMI 2.0. The Predator Triton 700 also features a mechanical keyboard and RGB backlighting. The Predator Helios 300 is designed for the more value conscious gamer. The laptop will be available in both 15.6-inch and 17.3-inch form factors with the same cooling solution as its bigger brother. The display resolution for both screen sizes is full-HD. Specifications include a choice of a Core i5 or Core i7 standard voltage 7th Gen Intel CPUs, an overclockable Nvidia GTX 1060 or 1050Ti GPU, up to 16GB of RAM that upgradable to double the amount, and SSD and a regular hard drive for storage. Acer has also fitted a compartment underneath the chassis to make it easy for the user to upgrade memory and storage components. The laptop also has Dolby Audio Premium for better quality audio.